Build a Windows Azure portal on-premises with the Windows Azure Pack! 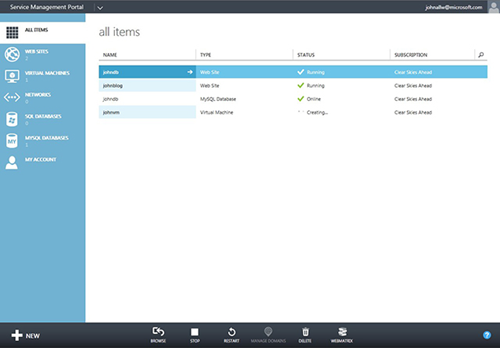 Have you used Windows Azure’s clean and simple management portal and wished you could build the same kind of portal for your Private Cloud? Well, now you can – with Windows Azure Pack. 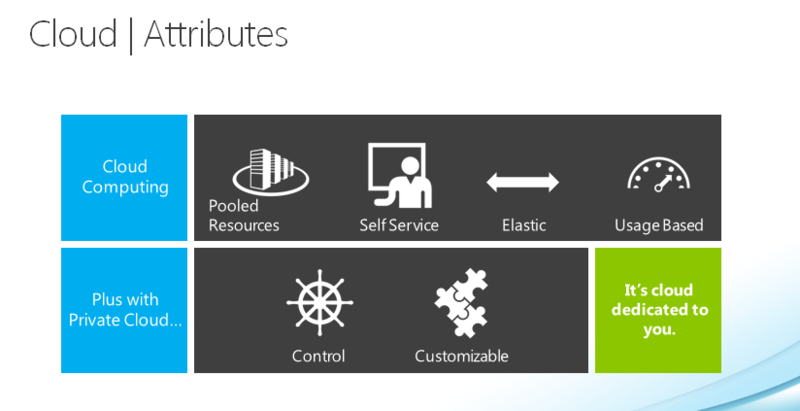 Releasing soon, Windows Azure Pack for Windows Server is a collection of Windows Azure technologies, available to Microsoft customers at no additional cost for installation into your data center. It runs on top of Windows Server 2012/Windows Server 2012 R2 and System Center 2012 R2 and, through the use of the Windows Azure technologies, enables you to offer a rich, self-service, multi-tenant cloud, consistent with the public Windows Azure experience. This can make your Private Cloud interface look like one from a real service provider. Management portal for tenants – a customizable self-service portal for provisioning, monitoring, and managing services such as Web Sites, Virtual Machines, and Service Bus. Service management API – a RESTful API that helps enable a range of integration scenarios including custom portal and billing systems. Web Sites – a service that helps provide a high-density, scalable shared web hosting platform for ASP.NET, PHP, and Node.js web applications. The Web Sites service includes a customizable web application gallery of open source web applications and integration with source control systems for custom-developed web sites and applications. Virtual Machines – a service that provides infrastructure-as-a-service (IaaS) capabilities for Windows and Linux virtual machines. 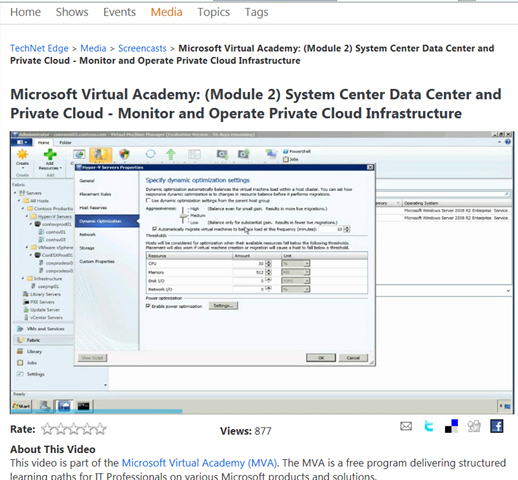 The Virtual Machines service includes a VM template gallery, scaling options, and virtual networking capabilities. Service Bus – a service that provides reliable messaging services between distributed applications. The Service Bus service includes queued and topic-based publish/subscribe capabilities. Automation and Extensibility – the capability to automate and integrate additional custom services into the services framework, including a runbook editor and execution environment. At the moment, the Windows Azure Pack is in “Preview”. 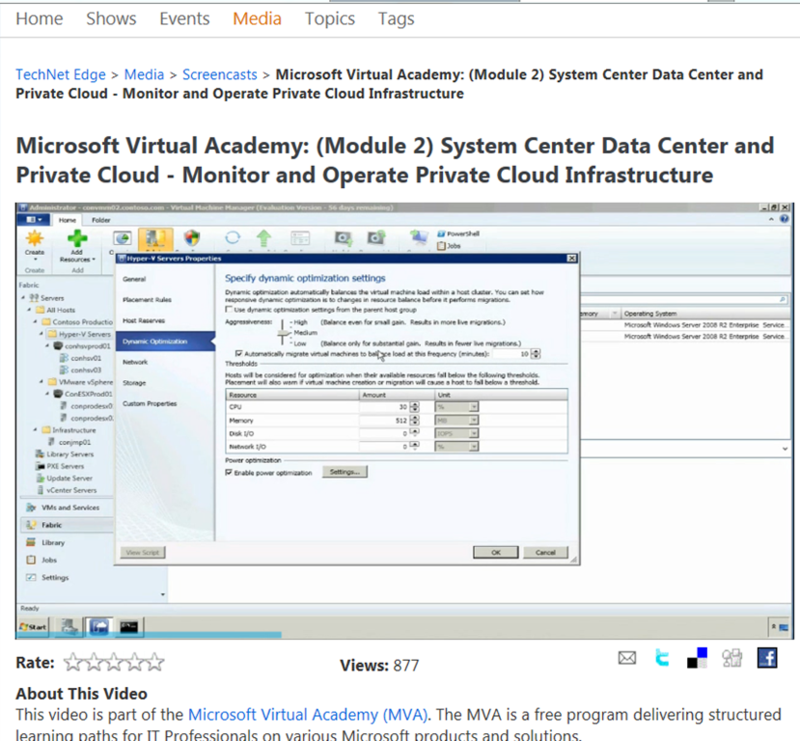 Subscribe to this blog to be alerted when Windows Azure Pack becomes available! Qatar Airways, awarded the World’s Best Airline in 2011 and 2012 is one of our customers in Qatar that have enrolled into the Windows Server 2012 Rapid Deployment Program (RDP) powered by our partner ICT WLL. Join us on September 18 for the Microsoft Enterprise Connect event and hear Mr. Shibu Mathai, Manager – Infrastructure Design at Qatar Airways share Qatar Airways’ experiences on Windows Server 2012 Hyper-V. Attendance to this event is free, but seats are filling up fast. Please make sure you register ASAP to confirm your place. The shift of enterprise IT to the Cloud is a tremendous opportunity for you to reduce costs, increase business agility, efficiency and productivity, as well as engage people in innovative ways. According to the Gartner 2011 CIO Survey, ‘almost half of all CIOs expect to operate their applications and infrastructures via cloud technologies within the next five years’. As Cloud becomes an increasingly significant priority in the Enterprise space, and more Cloud offerings become available with time, we invite you for an exclusive session where we will share the vision of Cloud Computing and have a value dialogue with you to see how cloud services can be incorporated in organization’s infrastructure for competitive advantage and minimal risk. Only one out of every 5 datacenters in the world are operating efficiently, as per new research from IBM. 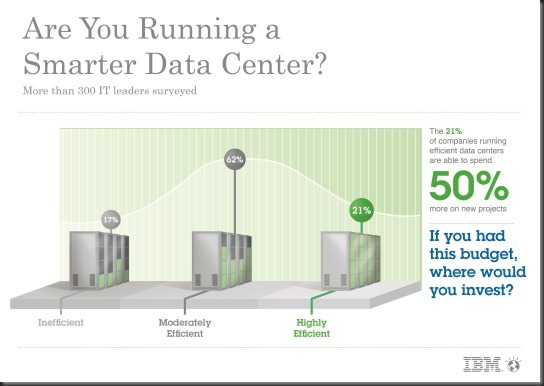 Out of 300 data centers surveyed in the IBM study, conducted by IDC, only 1 in 5 are operating efficiently. Furthermore, nearly 80 percent of the 300 CIOs and IT leaders were found to be behind in making the most of their IT investments. The study found that only 21 percent of companies surveyed are operating data centers at the highest level of efficiency. These optimized companies are able to spend 50 percent more of their IT budget on new projects and innovation to make their organizations more successful. The vast majority – some 62 percent are somewhat efficient. And another 17 percent are operating at a basic level. Have a plan that aligns with business goals and keep it current. Optimize your current server, storage, network and facilities assets to maximize capacity and availability. Design for flexibility to support changing business needs. Use automation tools to improve service levels and availability. Less manual manipulation means faster response times. My take on this? This represents a HUGE opportunity for organizations to re-evaluate their own datacenters and reflect on their IT spending. What percentage of your IT budget are you using for new projects, and how much of it goes into operating and managing existing infrastructure? And how can Microsoft help? 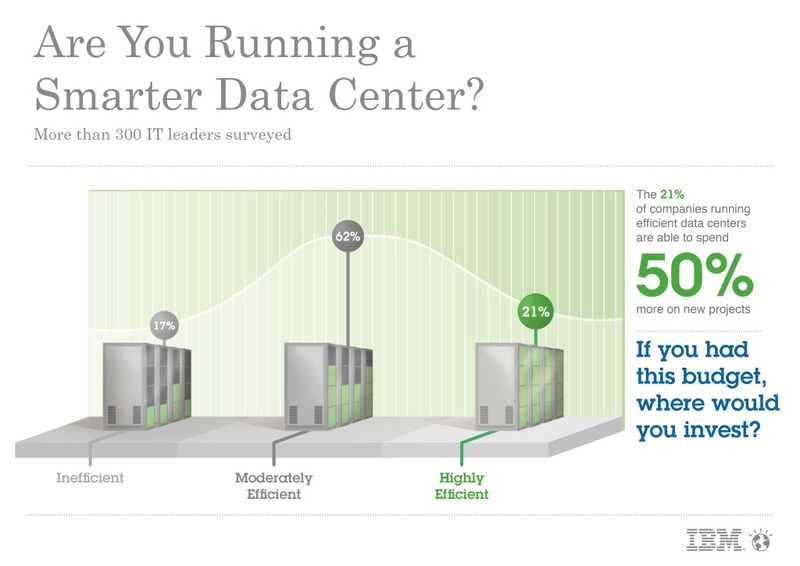 Look closely above at the 4 characteristics of highly efficient datacenters. Planning: Microsoft’s Private Cloud offering includes components like Operations Manager and Service Manager that help you make better informed decisions based on real statistical data from your own datacenter compared to SLAs that are defined with the business. Optimize your infrastructure to maximize capacity and availability. 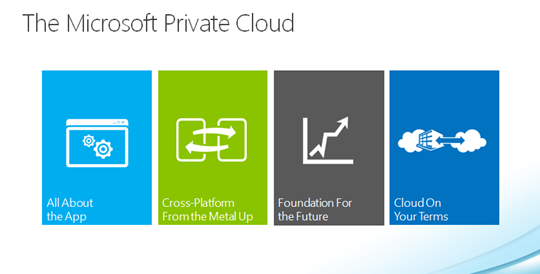 Microsoft’s Private Cloud solution helps you achieve that. You are able to capture your available assets into a “shared pool” of resources, that can be dynamically provisioned when your business application needs it. In other words, dynamic optimization, better utilization, more efficiency. Flexibility: Microsoft’s Private Cloud offering helps you achieve that degree of agility and flexibility to adapt to the changing needs of the business. Business application owners can request the infrastructure services to power their application, and be totally abstracted from the complexity of underlying hardware. What’s more, the datacenter now is able to allocate more resources for the application when needed, delivering utmost flexibility. Automation: Microsoft’s Private Cloud offering includes components like Service Manager, Virtual Machine Manager and Orchestrator (Opalis) that work together to provide you a highly automated datacenter based on workflows and run-books that you define, triggered automatically as conditions change in your environment. To know more about how Microsoft’s Private Cloud offering can help you achieve highly efficient datacenters, contact me. The Cisco FlexPod data center solution is now validated with a Microsoft Private Cloud Deployment Guide. The FlexPod is a physical product built on Cisco server (UCS), Cisco networking, NetApp storage and Microsoft Private Cloud Fast Track architecture with Windows Server 2008 R2 and Microsoft System Center. It can be optimized to fit a variety of mixed application workloads and use cases as the customer moves to virtualization and private or public cloud environments. Download the deployment guide on the Cisco FlexPod DesignZone. On another note, Cisco has also published documentation indicating the extension of their Nexus switches to work with Windows Server 8 Hyper-V, making use of the open extensible switch coming in Windows Server 8 Hyper-V – which allows networking vendors to support network virtualization capabilities with Hyper-V.
Today, Microsoft announced a major new development in the Microsoft private cloud strategy and core management platform, the launch of Microsoft System Center 2012. System Center 2012 allows you to manage your virtual, physical, and cloud environments from a single console, using common and consistent experiences that provide full control across your existing datacenter investments. Optimized for service delivery and providing both flexibility and control, the Microsoft private cloud enables you to experience IT as a Service on your terms. Adopting a more service-driven IT model can help you provision services faster—freeing up resources and enabling greater business agility to respond quickly to customer demands. With these streamlined purchasing options and enhanced private cloud capabilities, we are also announcing changes in the licensing and pricing of System Center 2012. I am very excited about this brand new release of System Center and this is definitely testament to the fact that today we are committed to having the best and most complete Private Cloud solution in the market. 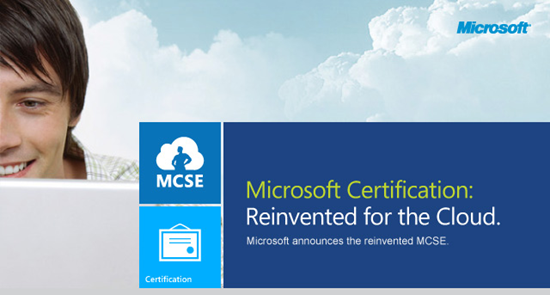 I will soon be posting more information on the new Standard and Datacenter editions and also provide more clarity on the new licensing scheme for System Center 2012 and how this will benefit both new and existing customers alike. In the meantime, you can learn more about the Microsoft private cloud and the exciting new features in System Center 2012 at the Microsoft private cloud website. Cloud Computing! It’s one of the biggest opportunities for IT Professionals in recent years. But wouldn’t it be great if there was a simple, effective way to get the skills and training you need to take advantage of this opportunity, and also get the recognition and rewards that you deserve? 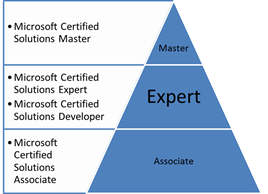 This is where Microsoft can help give your career a boost. 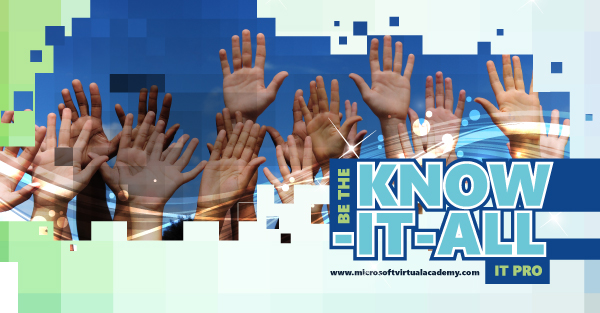 Visit the Microsoft Virtual Academy training portal now and register to receive free and easy access to training for IT Professionals who want to get ahead in cloud computing. This content was developed by leading experts in the field, and the modules ensure that you acquire the essential skills and gain credibility as a cloud computing specialist in your organization.